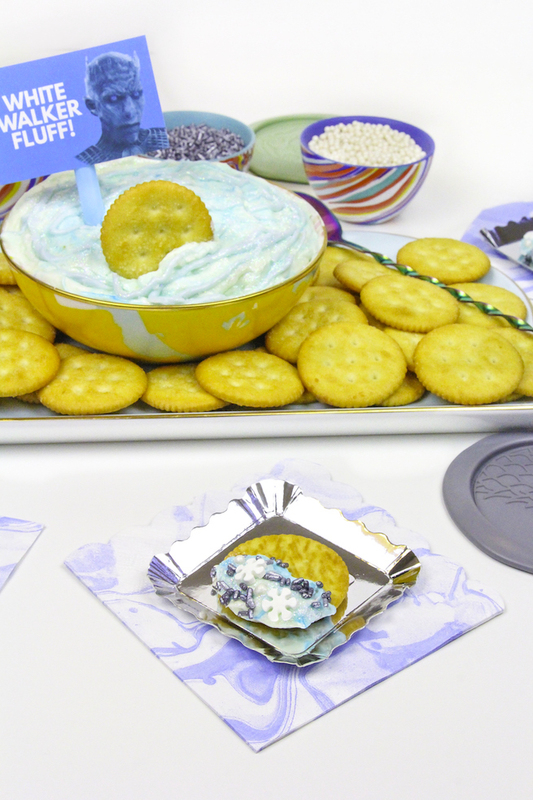 DIY White Walker Fluff Dip & Sprinkle Bar! I don’t know about you, but I am counting the days until Game of Thrones premieres on July 16th! 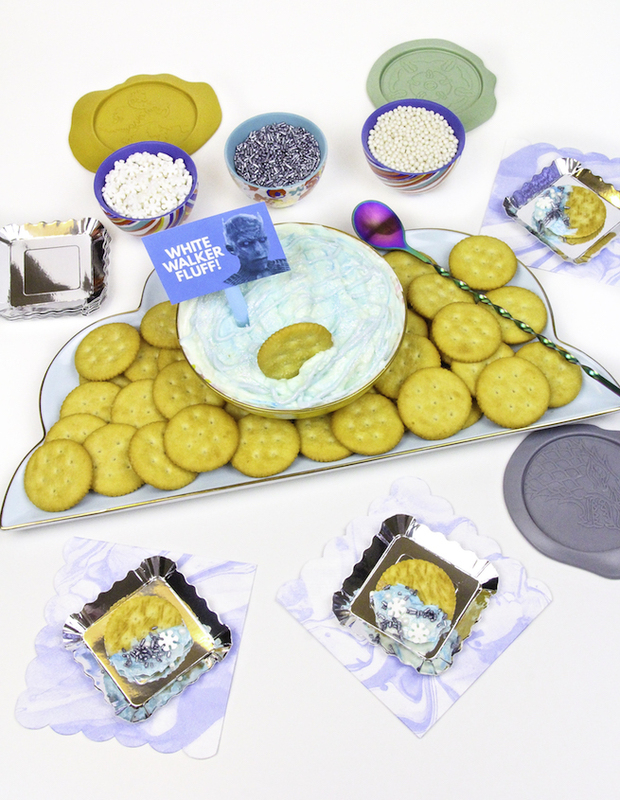 I am a certified fanatic of the show and was already planning a viewing party, when I got the amazing opportunity to work with RITZ Crackers and Popsugar to showcase a fun and tasty treat I’ll be serving to my viewing party guests. 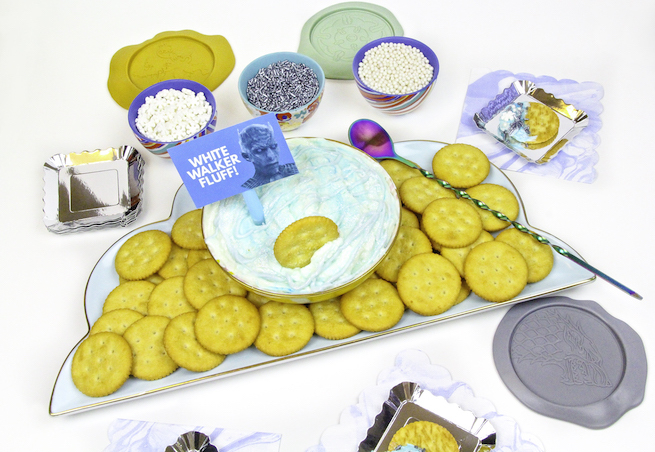 I’m all about fun a creative themed treats for my viewing parties, so I will be serving a DIY White Walker Fluff Dip & Sprinkle Bar for my party guests! 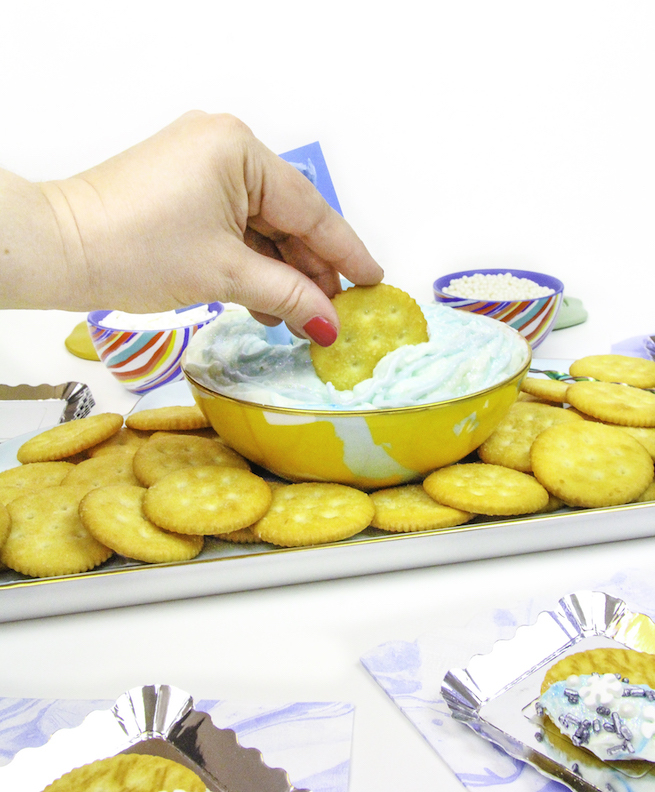 It’s super easy to make and it allows you to have treat to dip your RITZ crackers into and enjoy for the entire show. 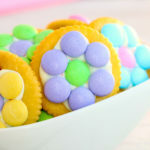 RITZ crackers are perfect for any get together as they go great with all kinds of flavors, both sweet and savory. 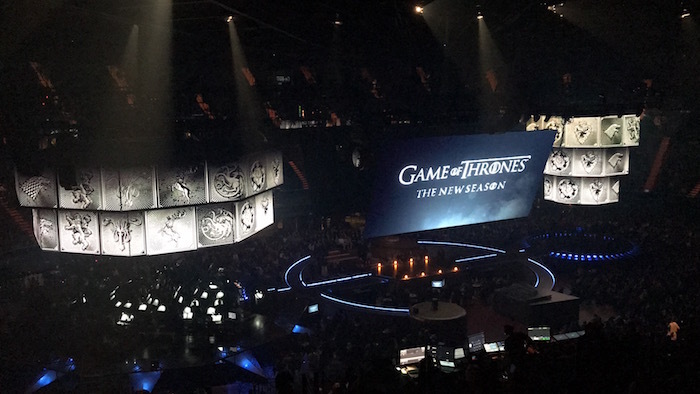 If you don’t believe I love the show, here is a picture from Game of Thrones Live, which I just saw last month. I’m the real deal folks! Jon Snow rocks my world! If you love the show as much as I do, here is what you’ll need to make this easy spread for your own viewing parties. One box of RITZ Crackers Original Flavor. 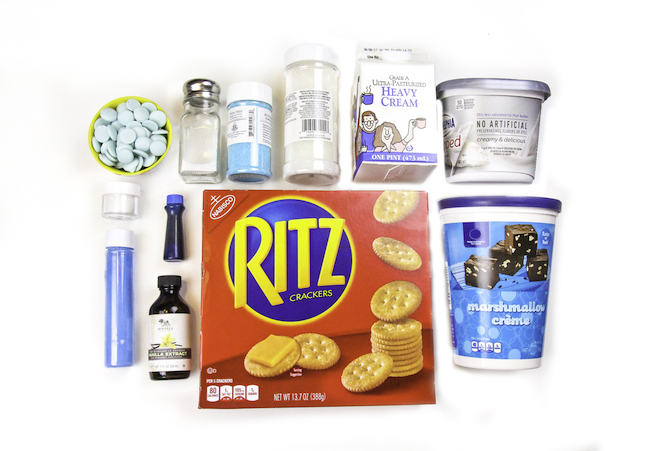 Varity of white, silver, and snow themed sprinkles. 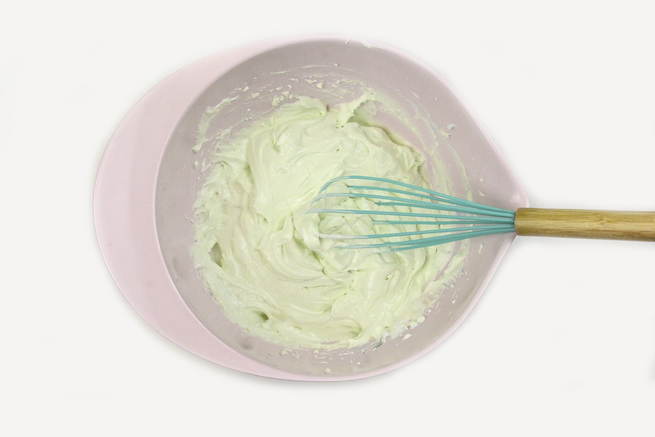 In a mixing bowl you’ll blend the marshmallow crème, whipped cream cheese, salt, vanilla extract, and heavy cream with a hand mixer. Once your ingredients are combined and fluffy, you’ll then add the blue powdered sugar. You’ll fold it into your fluff. Lastly you’ll add a few drops of blue food coloring, to give your fluff a while and blue swirl to it. You’ll place it into a bowl and garnish it with white and blue sanding sugar. You’ll also sprinkle on some edible glitter and some melted blue chocolate candy melts. That’s all you have to do to make your fluff dip. 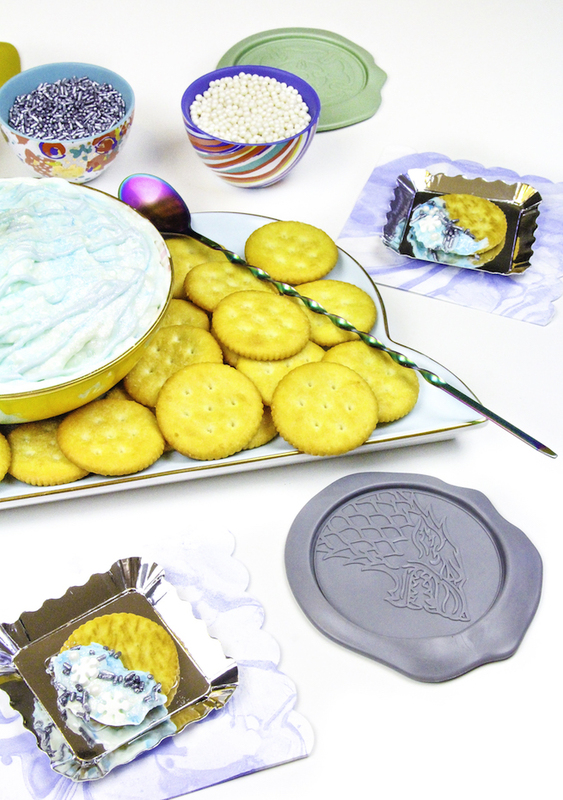 You’ll then place your fluff dip bowl on a platter surrounded by yummy RITZ crackers. 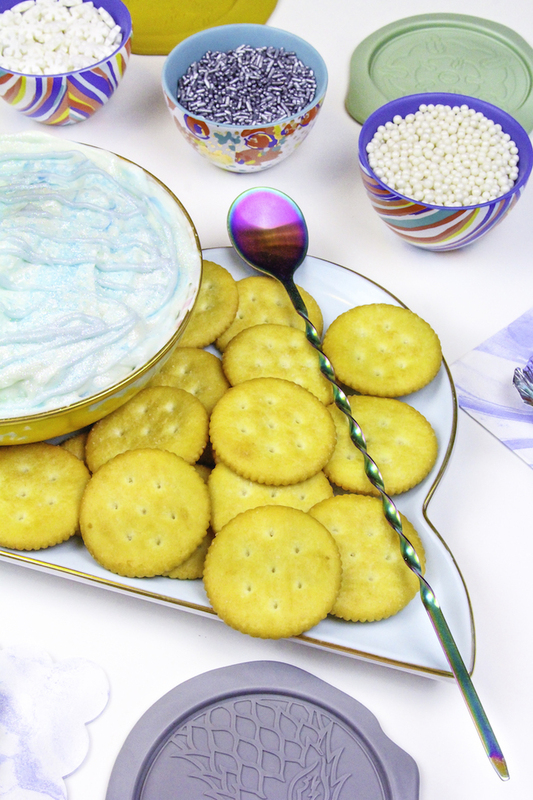 You’re guests can reach for a RITZ and dip it into the fluff. 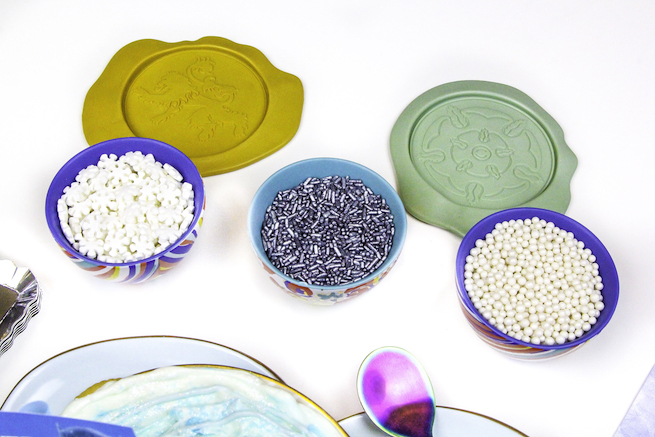 You set up your small bowls of sprinkles, so they can add more garnish to their dipped crackers. 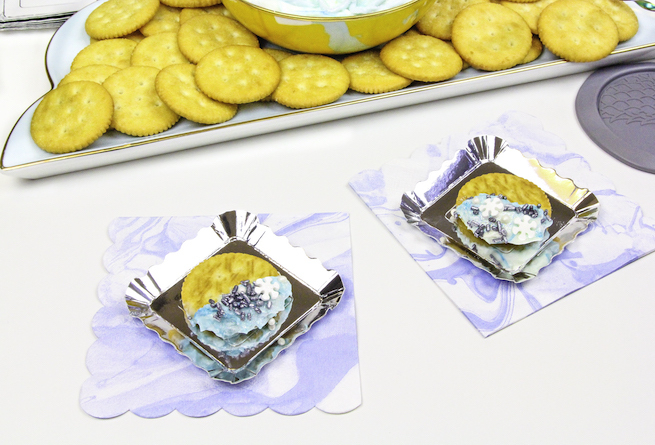 This will give your guests choices on how they can garnish their dipped crackers. Keep a spoon around so you can keep the dip mixed through out the show. I set out some house sigil coasters to have another fun Game of Thrones touch in our party. 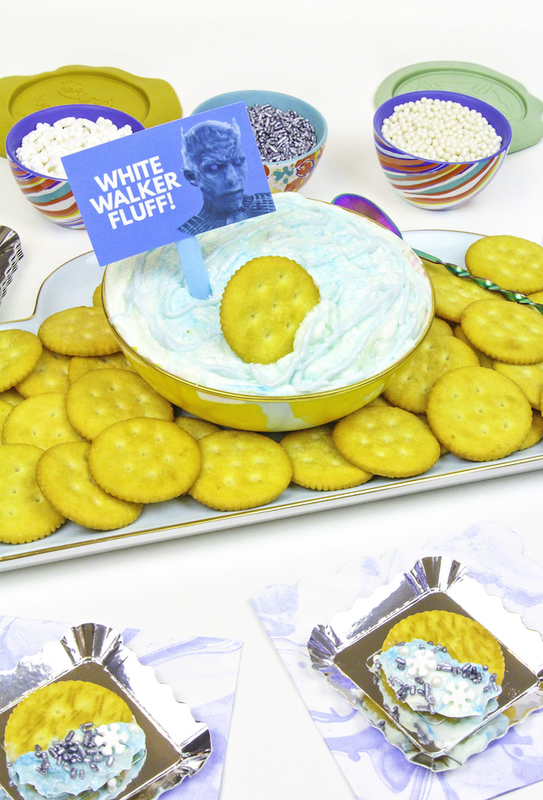 You can also add a little white walker fluff sign to your dip and some small plates, for a little added touch to your party. You have a fun themed and creative tasty spread to enjoy during the premiere of the show. 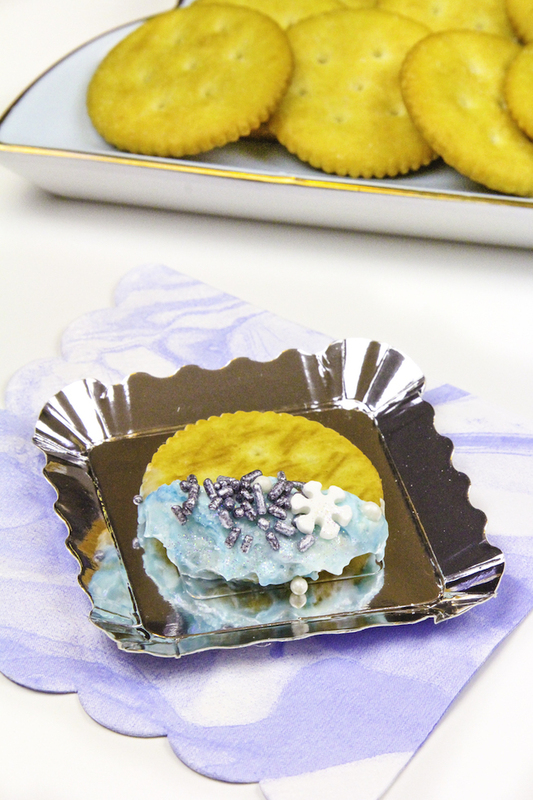 It’s the perfect winter is here themed treat! I love how fun it is and how it captures the magic and winter theme of this upcoming season. 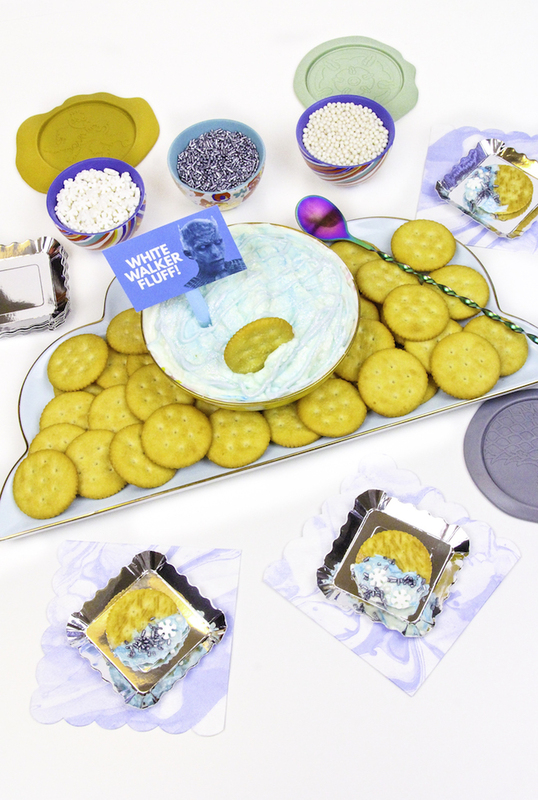 It’s all about the white walkers this season, so you should have a fun white walker themed treat for your viewing party. I can’t wait to serve these to my guests! I know they are going to love it as much as I do! How fun is this folks? Love it! I hope you enjoy this fun and creative viewing party treat as much as I do. Count down to our party and Game of Thrones has begun! 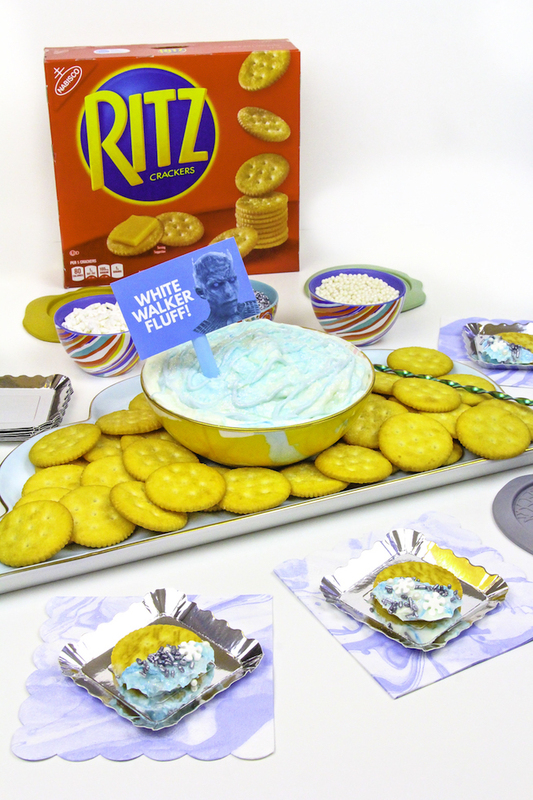 I know you’ve got the stuff to make a fun RITZ snack, comment below and tell me what you would make for the season premier of your favorite show. 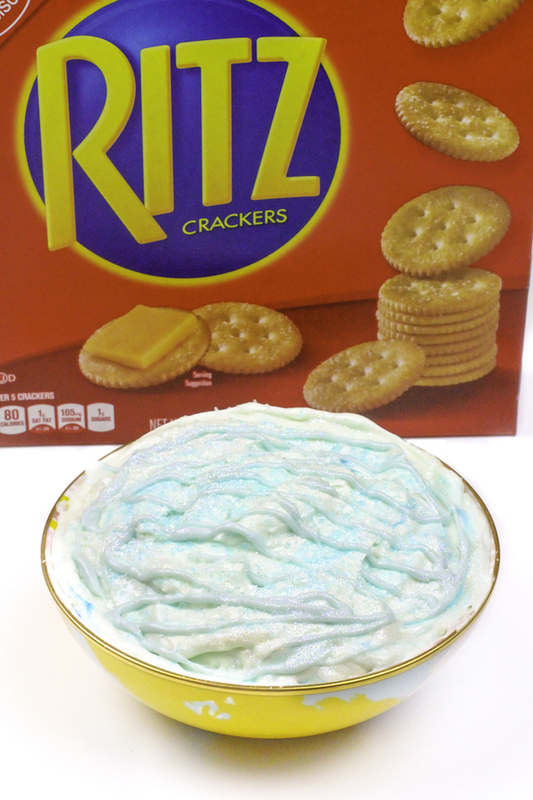 For more fun recipes for your party visit ritzcrackers.com. Also check out the new Ritz “You’ve got the Stuff” commercial below! This post is sponsored by Ritz Crackers and POPSUGAR. Thanks for supporting the amazing brands that keep this Brite & Bubbly party going! 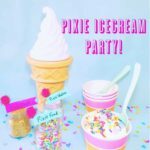 Pixie Ice Cream Party To Celebrate Tinker Bell and the Legend of the NeverBeast! 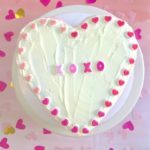 Yummy Valentine’s Day Ombré Heart Piñata Cake! 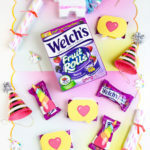 DIY Welch’s Fruit Rolls Unicorn Party Favors!